Not all Labels are the same. With the amount of choices there are when you are deciding to create a woven label, we want to help you take the guess work out of the thread type you choose! The most common threads used are satin, taffeta or damask. Damask is our number one label of choice because of it’s versatility and overall consistent quality. When you take a look at the labels in your own clothing, you are mostly seeing a woven damask label. 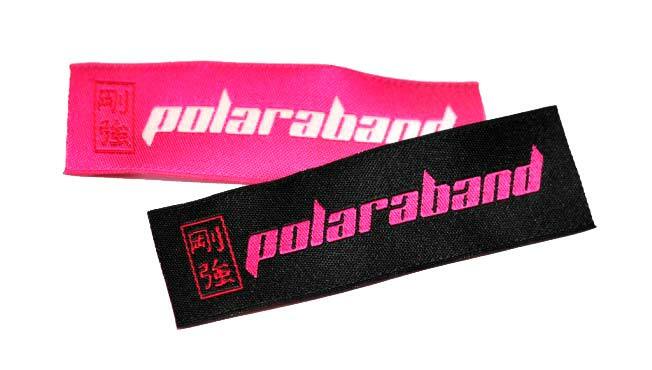 There are also printed label options, but for the sake of this blog, we are sticking with woven labels for now. Satin. With satin, the fibers are larger and they can’t be woven as tight as a damask woven label; however, it does provide a nice shine and is soft to the touch. If this is an important feature to your final product, this might be a great option for you. Here is a great example of a Satin Label. Do take notice of the shimmer and shine you see because of the satin threads. Regular Damask. The regular damask labels use 80 Denier Threads, which means a higher thread count. 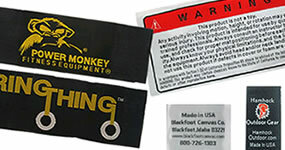 This is the most commonly used thread in a woven label and provides a great deal of detail. By far our most popular choice for durability and affordability. High Definition Damask – The high definition damask labels use 50 denier threads, making the fibers smaller than regular damask. This is what we encourage for labels that require a higher attention to fine detail. They are very smooth to the touch and for many high end clothiers, this is the option of choice. The cost is a bit more per label, but worth it if your artwork has a lot of detail. Below is a great example of a regular damask label (top) adjusted for more detail in the high definition label (bottom). Note the curtains and the mane of the lion. Taffeta – has a medium thread count. The fibers are somewhat smaller than the satin threads. The material has less shine to it and is more durable because the thread is synthetic and not natural. We suggest the use of taffeta if you are on a tight budget as the cost is less. However it is important to keep in mind that it’s a bit scratchy and we don’t encourage this type of label directly next to the skin. This picture shows a few examples of taffeta labels. 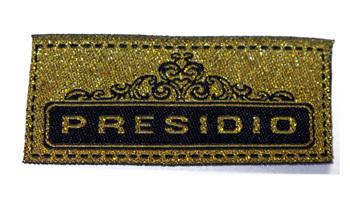 Metallic Threads – This is a fun option if you are wanting to provide a lot of bling for your labels. 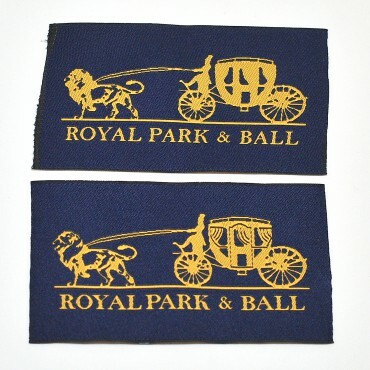 The metallic threads are an option in colors for you when you choose to create a woven damask label. The most important aspect to consider if you want your label to have this level of shimmer is to keep in mind it may not be as comfortable next to the skin. Consider this option for handbags, tote bags, outerwear, hem tags, on the outside of clothing or very popularly, on stuffed animals and toys. This should help you to understand a little better the options available to you. The best resource we have for you is our team of experts. If you are simply wanting a label and need help knowing what type you need; this is where we come in and let you know the best options for your use. Just give us a call or complete the ‘free quote request’ form and we will be more than happy to take the guess work out of this for you.